The AxpDataGrid from Axezz is much more than another web grid component. This control can automatically generate both forms and grids from OleDb data sources. If you haven't looked at this component lately, look again, you'll be pleasantly surprised. There is an excellent reason to consider using Axezz's AxpDataGrid in your next web project--it’s one of the most all-inclusive and painless to use grid components for ASP.NET. To my delight, the AxpDataGrid exceeded what I would normally expect from a grid control. 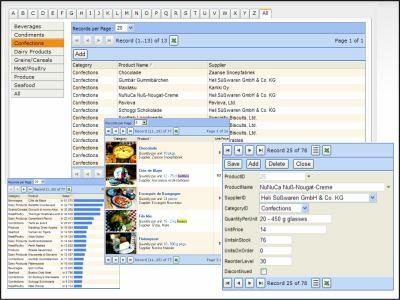 In fact, the AxpDataGrid is one of the most amazing ASP.NET controls that I've worked with. It’s very easy to use; just two properties need to be set to display records in the grid with paging (select the number of records to display per page), sorting, and export to Excel enabled. Setting a few more properties allows you also to view, edit, add, and delete records. Any of these features can be turned on or off easily. The AxpDataGrid works with OleDb databases like Microsoft Access, SQL Server, Oracle, and Sybase Adaptive Server. Microsoft Excel can also be used as a data source via the Jet OleDb provider. You can also display any data that you can get into a DataSet, DataTable, or DataView. Additionally, the built-in export to Excel function allows the current record set to be opened in Excel or saved as an Excel workbook. I have found this feature to be indispensable; user’s love it because they are familiar with Excel, and I love it for reporting and creating charts. A unique feature of the component is its ability to generate different views: a grid for viewing multiple records, a form for viewing a single record, and a form for editing a single record. That’s right--the AxpDataGrid can generate both grids and forms. With the ability to automatically generate forms comes the added feature of being able to create a data entry form that allows users to add new records without displaying a grid. One of the nice touches to the form is the ability to page through records; this is similar to an Access form. In addition, data type validation is built in so that if a user tries to input text into a numeric field they are told to change their input. And when a record is saved, a confirmation message is displayed. Delete confirmation is not automatic, but can be added easily by setting, you guessed it, just one property. The AxpDataGrid uses CSS stylesheets for formatting including button images. The product has 35 different stylesheets included, and of course you can create your own stylesheets and button images. I was very impressed with the performance of this component, even on very large SQL Server tables on a remote server. The component can be integrated easily into Microsoft Visual Studio 2003 and Web Matrix. I received quick responses to my technical questions via the forums. There are many other advanced features, all of which are covered in the documentation. A simple HTML-based editor and a popup calendar are included for use in forms. The Axezz web site has a free trial download, online documentation, online samples, online tutorial, free open source application named AxpQuery (based on the AxpDataGrid), forums, knowledge base, and more. Check it out for yourself. The component is reasonably priced compared with other grid controls, for $149. You can get a single developer license, 2 sites runtime license, or 1 server license. I accidentally found that when some AxpDataGrid properties are not set correctly, for example not setting the primary key when you enable editing, the component displays an error message letting you know exactly what is wrong, but the connection to the database is not closed. Since this should only happen during development it's a small issue. Axezz is undeniably devoted to providing the best grid component available for ASP.NET. Releases with new features and fixes are frequent--six so far this year. In fact, a prerelease of the AxpDataGrid for ASP.NET 2.0 (beta 2) is included in the download. The product comes equipped with first-rate documentation and over 30 examples in both C# and VB.NET. If your next ASP.NET project demands an advanced grid component, with the largest array of options and awesome flexibility, I highly recommend purchasing the Axezz AxpDataGrid. I believe you will find the experience both satisfying and inspiring as you discover that this component delivers more than you expect.